Here I am introducing a simple task switching on an AVR as a demo... I did this just to get familiarized with the AVR assembly language programming.. Now I believe I learned it to an extent. Also I loves assembly language because it offers a great deal of power to use all of the features of the processor. Switching multiple tasks on a same CPU is the one of the major function of an operating system. What I did now is a time sharing multitasking (time multiplexing) on an AVR. Here an atmega32 is configured to use Round-Robin Multitasking. 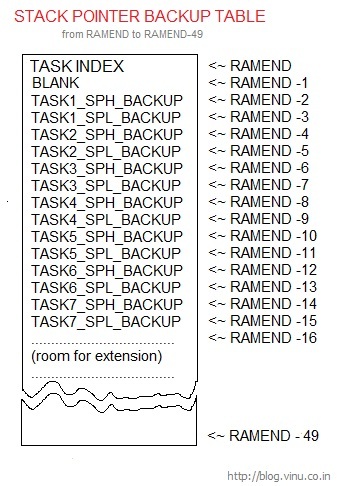 Round-Robin allows quasi-parallel execution of several tasks. Tasks are not really executed concurrently but are time-sliced (the available CPU time is divided into time slices). Here, in my code below, it consist of 7 independent tasks and those are switched from one to another on a timer interrupt. 'May be' this could be considered as a simple & very very basic RTOS demo. Here I am mainly focusing on the core part ie the "task switching". 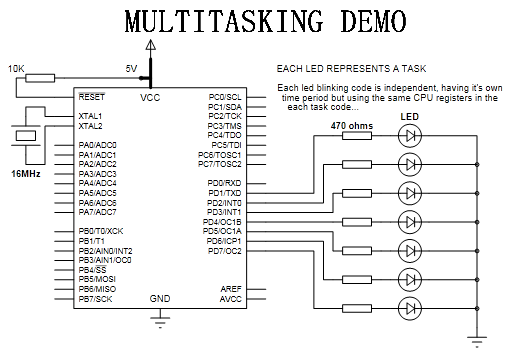 Each led on the demo represents a task. Task1 (right most led, WHITE) is a software PWM task. All other tasks (2 to 7 from right to left) are toggling tasks. If you concentrate on a single LED, U may notice that the particular LED is toggling with a constant delay and is independent of others. 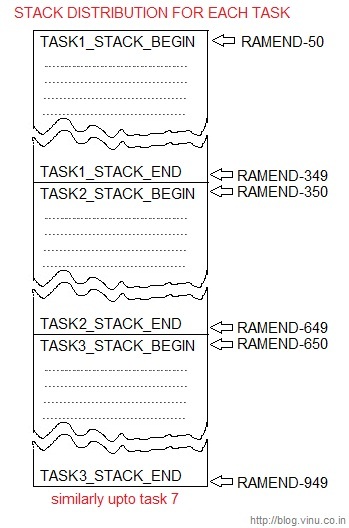 as the stack for each task. When the timer reaches the compare value, it trigger an interrupt. Now inside ISR, at first all the registers are pushed onto it's stack. Program counter is already push (automatically) at first when the interrupt is triggered. Now after pushing all the registers, the status register is pushed onto the stack(avr doesn't do it automatically). Thus we made a backup of all the register values and the status register and we are safe to use those register for some other purpose. Now the next process is the switching between tasks ie the context switching. Before that we need to backup the current stack pointer otherwise we will miss it and couldn't resume the task when it's time slot appears for the next time. So a 50(more than enough) bytes are reserved from the RAMEND to store the task index(which task is running now) and the stack pointers of all the tasks. This is considered as the stack pointer backup table or array. ;at different port bits are toggling at different speed. ;the task starting address for the first time..
;  Also don't forget about the RAM capacity..
;on each task. All the delay related registers are common to all tasks. ;THIS IS THE MOST IMPORTANT PART OF THIS PROGRAM. ;FROM THE SAME TABLE AND LOAD IT TO THE STACK POINTER.